Mr. Nerd and I are huge hiking advocates. We spend a lot of travel time hiking up mountains and into forests, along icy paths, through mud, streams, and poison ivy... You name it! If you're curious about some of our previous hiking adventures, check out our posts on why you should go hiking and that time Mr. Nerd proposed while hiking near a nuclear power plant. If I'm honest, some of our favorite hiking adventures have been ones we haven't planned out in advance (we seem to like spontaneity). There's something incredibly refreshing about connecting to nature when you need it, not just when the fancy passes through your mind like an afterthought. It's more intimate when the desire seizes you and orchestrates a hike without much planning. More exciting. Our hike up Mount Esja in Iceland was no exception. 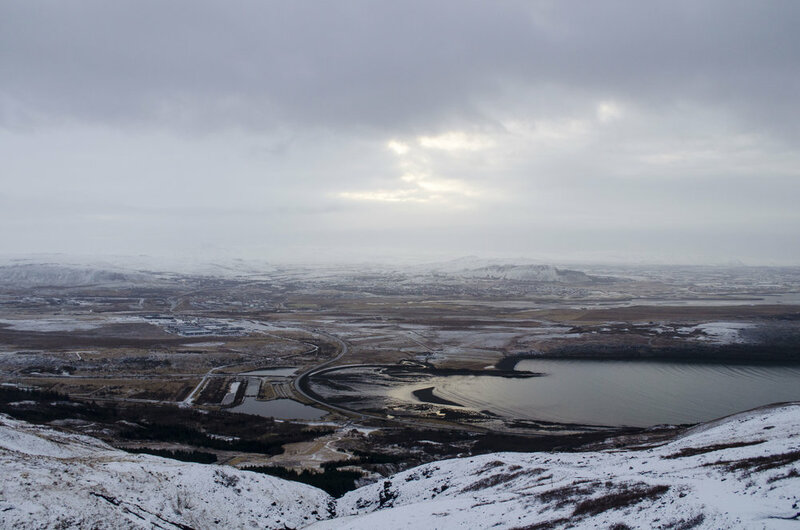 The day we decided to hike up Mount Esja, we actually had other plans. 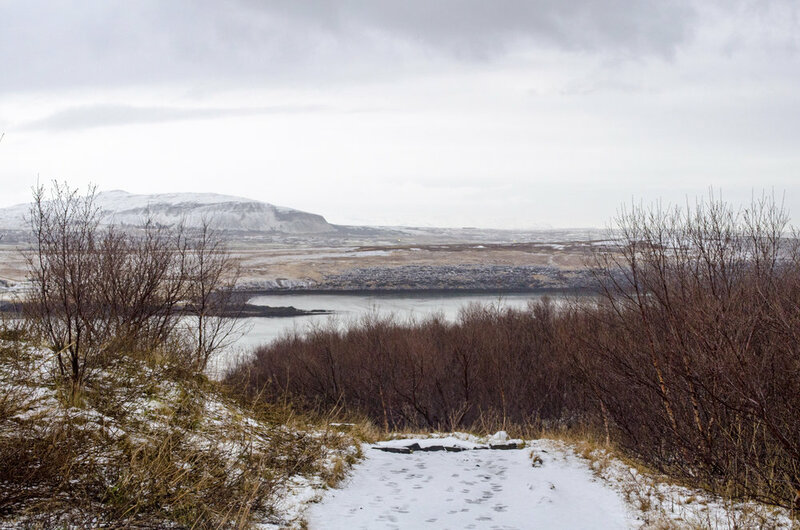 We were scheduled to take a small road trip to Vik and spend our morning riding Icelandic ponies and our afternoon visiting beautiful black beaches, but the road conditions that late in November and the dwindling daylight made us decide to cancel our trip. With a sudden opening in our itinerary on the last full day of our stay in Iceland, we both knew we wanted to do something unique—something that would send us back home with a bang. 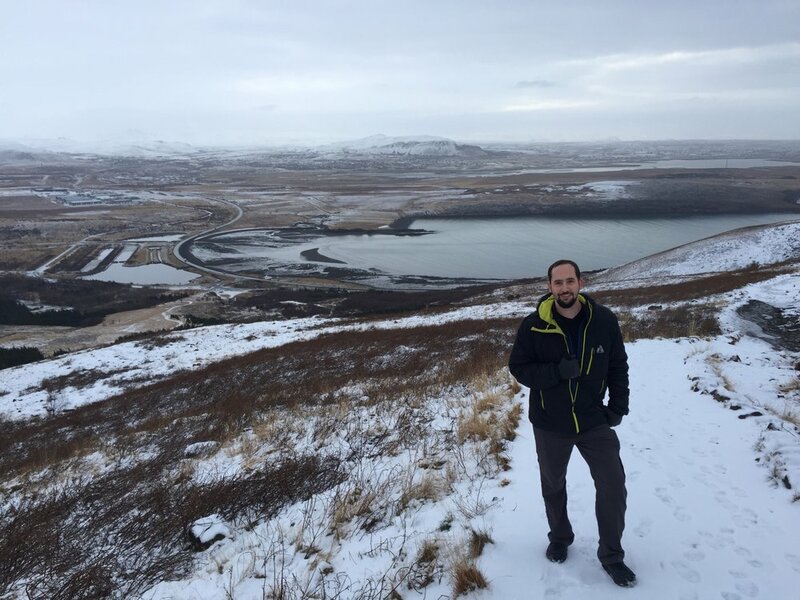 It was only then I remembered that I'd heard whispers of the hiking trails at Mount Esja, a gorgeous volcanic mountain range we'd seen many times from our walks through downtown Reykjavik. A quick Google search showed that it was a mere 15-20 drive away, and the parking lot at the trail head was easy to find and free. Score! Immediately, our minds were made. We dressed for success (as you have to do during a November trip to Iceland) and hopped in the car around 10 a.m., stopped only to grab some beef sticks and water, and drove to the trail head. The parking lot was empty but for a single car that had marred a fresh dusting of snow with its tires. We parked and took a moment to put crampons on our shoes (those rubber things with spikes, which are absolutely necessary if you want to hike this in any month that has snow). It was quiet. We were surrounded by trees and shrubs, which blocked the wind and street noise in the distance. All we could hear was the sound of our breath and the crunch of ice underneath our feet. Instant love. At the start of the trail head, we looked at the map of trails and decided to hike to a place called Steinn (the stone) that was about 1.7 miles up (2.8 km). Apparently, most hikers (tourists and Icelanders alike) hike at least as far as Steinn, if not further. But since it had been snowy in the area with lots of ice, we decided to hike to Steinn and back. If you decide to go further than the Steinn, be prepared to do some climbing. The trail past Steinn becomes a bit more dangerous and harder to hike in order to reach the top. If we'd had more daylight hours and better gear, we may have attempted the hike to Þverfellshorn, one of the peaks in the mountain range. From there, you can connect with a network of other trails—perfect for a full excursion during the long hours of summer! The first portion of the hike was easy to tackle. We followed a designated path up several of the mountain's rolling curves, passing trickling streams with clear mountain water (some of which are safe to drink and taste absolutely amazing) and vibrant evergreens. By the looks of the footprints in front of us, only two people had started up this particular section of Mount Esja that day, which made the hike even better. After being surrounded by tourists for most of our time in Iceland, the silence (but for our heavy breathing) was a complete delight. The constant sunrise/sunset lighting made everything soft and peaceful, too, which we reveled in when we weren't gasping at the ache in our legs. Hiking up a mountain slope is serious work, people! 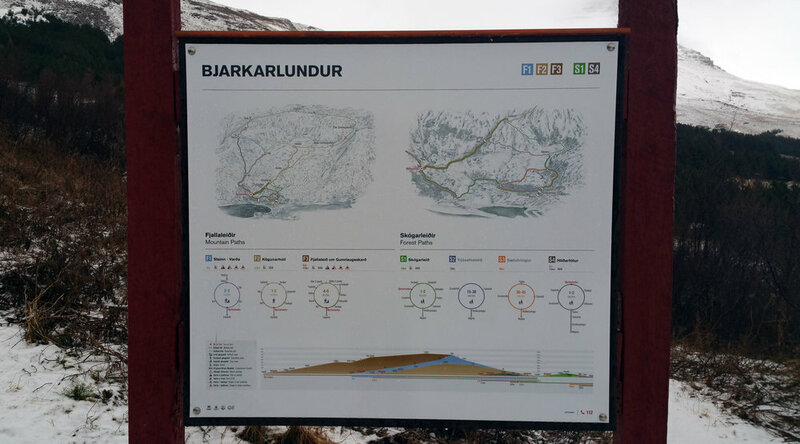 About halfway to the next stop (each leg of the hike is marked by a number and a marker), we were overtaken by an Icelandic gentleman in his forties who wore nothing more than a t-shirt and hiking pants. We stepped aside for a breather and watched as he jogged up the path and disappear into the fog ahead. It was then we realized how terribly out of shape we were (and are). Either that or that man's legs were made of steel. Maybe he's a robot. We're not sure ... we never saw him again, which means he went up to the peak. He deserves all the kudos. We reached the second trail marker of four, and looking around, I thought I saw Steinn in the distance. A path extended to our right, crossed over a bridge, and went up a small hill, where we saw one of the original hikers (from the set of two footprints) meditating atop of a bunch of rocks. Ben, who can read a map better than I can, shook his head. "That's not Steinn," he told me, reaching for the water bottle at my hip. "But we're close, I think." I wanted to go across the bridge where the hiker was sitting, probably a quarter mile away. Ben, on the other hand, talked me into going straight up the path where the Icelandic hiker had disappeared into the fairy mist. "He obviously knows where he's going. I bet we'll get there faster if we follow him." So we did. In hindsight, upon reading a couple websites, we discovered that the path I wanted to go along was the EASY path (leading to Steinn), and the path we took was the ADVANCED path (also leading to Steinn). We followed several switchbacks around corners and across trickling rivers, going up, up, up until our ribs burned and our legs threatened to give out underneath us. But we persevered, because dang it, we wanted to reach Steinn! The view, we'd heard, was indescribable. Also, we'd agreed that if we reached our goal, we would splurge and eat one last hearty Icelandic meal before heading home. And we usually take our goals pretty seriously whenever food is involved. Or beer. Icelandic beer is pretty good. We eventually made it to marker #3 (of 4), which led us into the heart of a valley that sprawled out lazily before the peak. At this point, our legs were killing us. We may only have gone a mile or so, but hiking steadily upward ... it was like being on a stair stepper for over an hour straight. I stopped to take a few photos, remove my gloves and hat (exercise really warms you up), and try to catch my breath. Thankfully, the valley we'd entered was pretty level. We couldn't see Reykjavik on the horizon anymore, and we couldn't see the path we'd just come from either. It was hard to estimate how high up we were. As we trudged through the valley and stretched our aching thighs, we caught sight of a solid shape on the curve of the peak above us. That must be Steinn, we thought! Finally! But the climb to get there is impossible to describe. Fueled by sheer determination, we followed the path until suddenly, we lost sight of it. 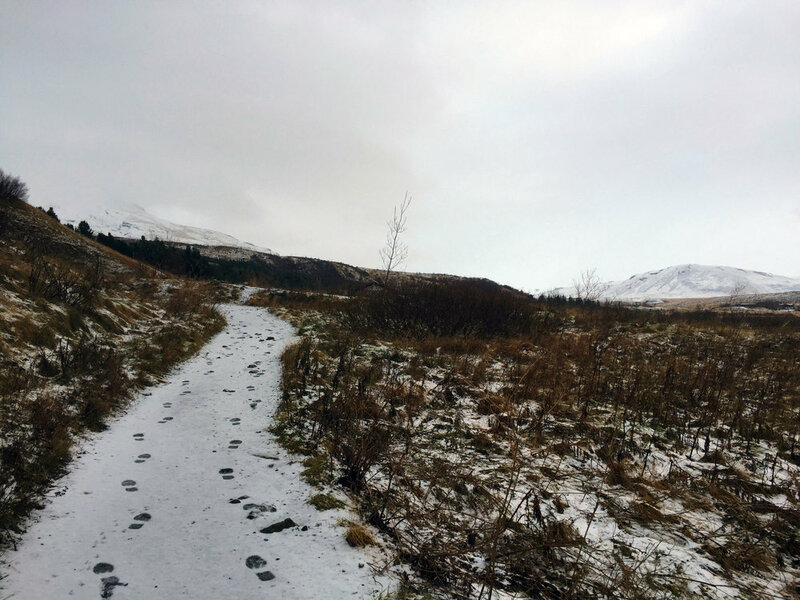 Ben discovered a set of footprints to our left, so we turned and used those prints as a guide—and found ourselves sidestepping up a sheer hill straight to Steinn, often sinking in white up to our calves when the ground gave way. If we hadn't had crampons on our feet, we'd have never made it up pure ice. The feeling of reaching Steinn after hiking for two hours was unbelievable. We collapsed, exhausted, and spent a good thirty minutes looking out over Reykjavik's beautiful landscape. It's really worth spending some time there if you aren't frozen to death yet. From where we stood, we could see the harbor, the sleepy town below, and other volcanic mountains in the distance. The sun peeked out between the clouds a time or two—a splendid treat we had all to ourselves. Ben signed the guestbook in the marker there (as seen in the picture). It's amazing how many people from all over the world have done this hike! We read through a couple pages, then reluctantly put the book back, re-donned our gloves and hats (it was getting pretty chilly), and started our descent. We decided not to retrace our steps (we're not that insane) and followed the EASY path down the mountain instead. It was a nice, leisurely walk, passing many streams and waterfalls along the way (like this one). By the time we reached the parking lot again, it was closing in on 3 p.m. It had taken us over three hours (probably almost four) to hike the 1.7 miles up and back. From all the switchbacks we did, my phone actually read that we hiked 6 miles, walked 12,000 steps, and climbed over 160 "flights of stairs." I don't think this hike is always so strenuous. 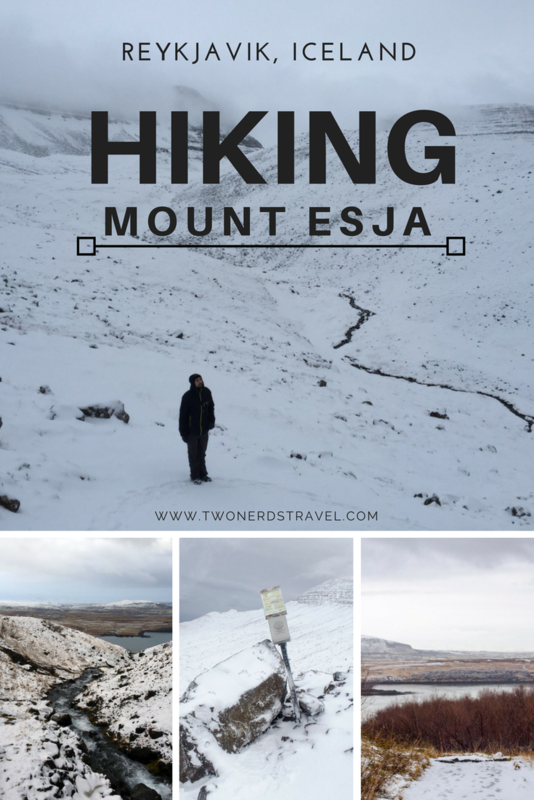 The snow, ice, wind, cold, and our general health (we really need to hike more) probably contributed to how long it took us to conquer Mount Esja. But we don't regret going in late November either, and given the chance, we'd absolutely do it again. Hiking Mount Esja in the summer vs. the fall gives you two very unique experiences. The landscape is different in the summer (little to no snow), and the hike up to the peak will be easier. We recommend going in the summer if you're not sure about hiking through ice and other obstacles. 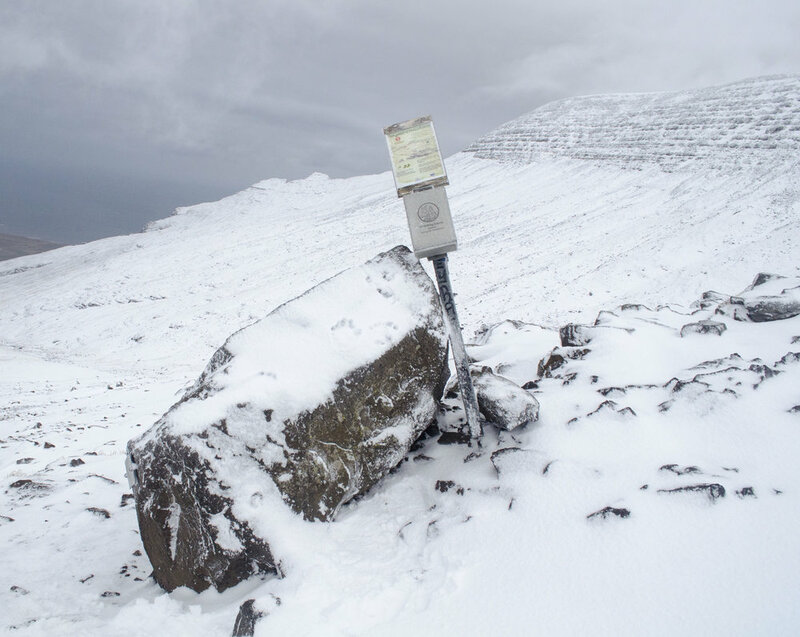 Bring crampons if you're planning to hike Mount Esja between October and April. 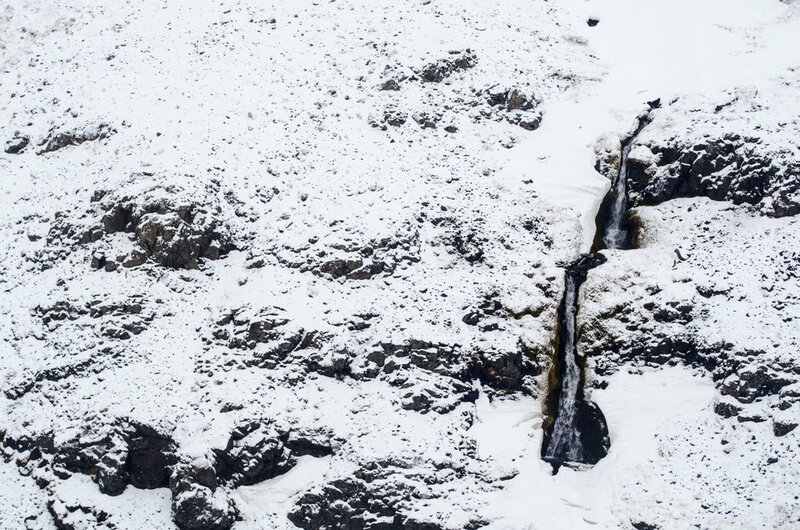 Icelandic weather can change at the drop of a hat; you'll want to be prepared for anything. 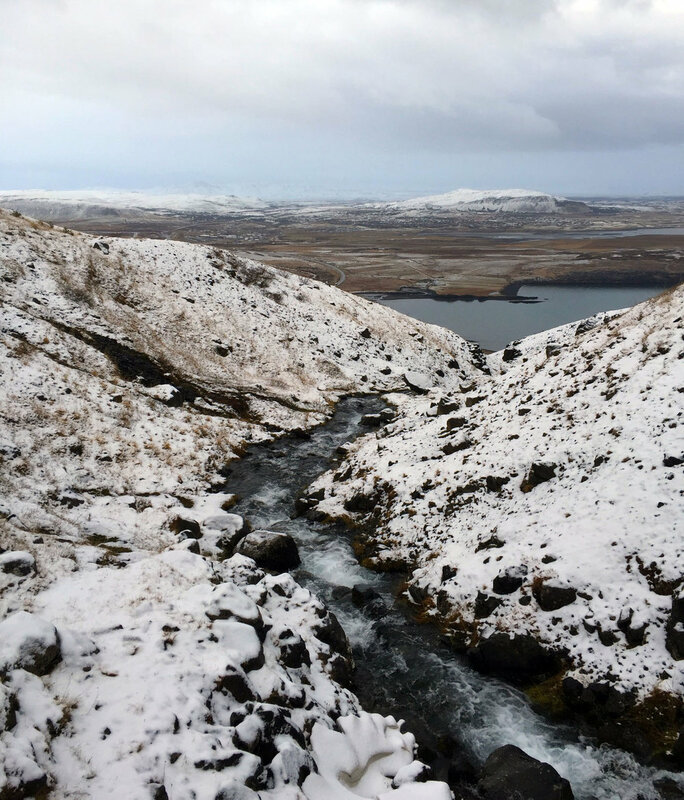 If you're crazy enough to hike Mount Esja in the winter (like us), check the weather the day before, the day of, and up to an hour before you plan to leave. Winter weather can be dramatic. We got lucky, but if it had snowed while we were up there, our experience would've been a different one. Plan to take proper clothing, bundle up, and consider using hiking poles too. Pack some snacks with you! We took meat and cheese ... and we ate it all. Hiking is a very strenuous activity. You'll need energy to make it to the top and back. Bring water. You'll get thirsty. Be careful of hypothermia, especially during the colder months. 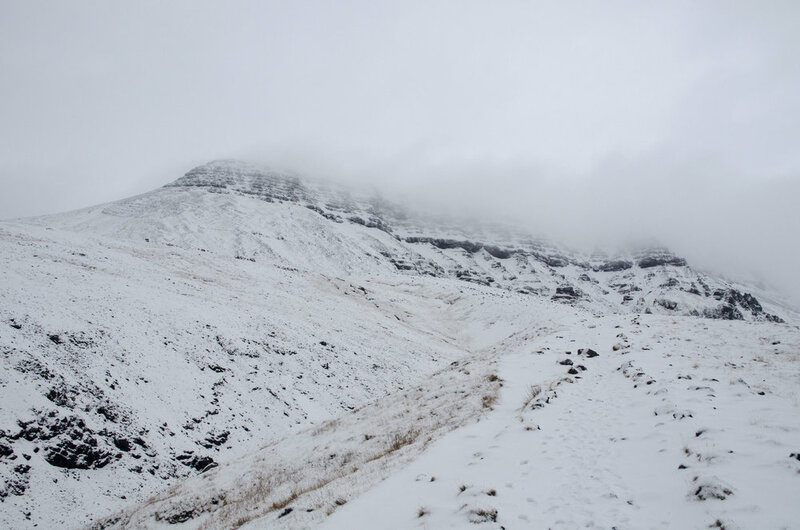 If you sweat a lot while hiking then cool and become cold, hypothermia can be a possible hazard. Always remain aware of your surroundings and stay on the designated paths. When things are covered in snow, it's hard (if not impossible) to determine the real story of the landscape you're walking on. We were lucky we didn't get hurt when we lost the trail. Others might not be.